Good news from the National Zoo: After more than 24 hours in a tree following a fright, giant panda cub Bao Bao has rejoined her mom. The National Zoo's panda cub came down from a tree late Christmas Eve after spending Tuesday night and much of Wednesday there. Bao Bao was spooked after apparently touching a "hot wire" in her enclosure and getting scared, according to the Zoo. "Staff determined that Bao Bao touched a 'hot wire' in her yard yesterday afternoon," said a Facebook post by the zoo Wednesday. The hot wires are not dangerous, but are part of a safe warning system used by the zoo to keep animals contained. 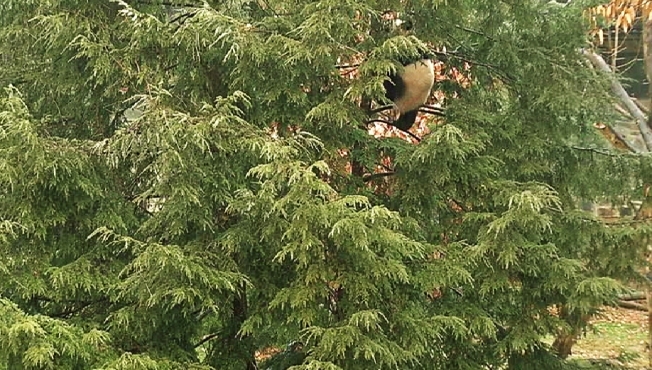 Sixteen-month-old Bao Bao remained in the tree overnight, and wasn't deterred by the rain that steadily fell through much of Wednesday. "Her reaction was to climb up a tree where she feels safe," the zoo said. "This behavior is predictable. Bao Bao is perfectly fine and like all Zoo animals, she is still learning the boundaries of her habitat." Zookeepers said the tree is among her favorites and is a comfortable place for her. Bao Bao's doting mom, Mei Xiang, also spent the night outdoors, waiting underneath the tree and keeping watch. Keepers said she was a little concerned. "A keeper stayed overnight in the panda house just in case they decided to come inside," the zoo said on Wednesday, before the cub climbed down the tree. "The staff are adjusting the pandas' routine today and are confident that Bao Bao will come down when she is ready." The Zoo is closed on Christmas Day, so visitors will have to wait another day to see Bao Bao back with Mei Xiang. "I hope she does" come down for Christmas, said a zoo visitor. "She should be with her mom and dad inside."